There are no men like me. There is only me. I’m deeply honored to announce that my story “The Fourth Fleet” will be reprinted as part of the upcoming anthology There Will Be War: Volume X by Dr. Jerry Pournelle. I have to admit to having been a bit surprised by this. Some of you may know Dr. Pournelle as one of the science fiction grandmasters. Or you may know him from his days as a science adviser to President Reagan. Or you may not know him at all, but recognize some of the other authors on the list – Dr. Martin van Creveld, Larry Niven, or Poul Anderson. I’m deeply humbled to find my name listed in such company, and I hope that the readers find that the story justifies its placement. As soon as I have a purchase or pre-order link available, I’ll post it. Going to go narcissistic for a moment. I’ve hit 30,000 words on my first novel (working title Post Traumatic Stress). Still a long way to go, but that’s a big milestone – and by far the longest thing I’ve ever written. A young man comes back from Afghanistan on a medical discharge after a helicopter crash only to find that his literal war demons have followed him home to terrorize his friends. He has to deal with them with the help of his not-quite-father-in-law, a young friend, a hapless and overly bureaucratic secret military group that gets in the way more than it helps, and an ancient order of knights chartered by the Vatican. The work is not strictly part of the Tales of Peter Bishop series, but it does tie in heavily to the series (the “young friend” mentioned in the blurb is, in fact, Peter Bishop). You might even say that this kicks off the series. Make Death Proud to Take Us has been Finalized! I just finished uploading the final files for Make Death Proud to Take Us. It will be available to readers on Sunday, June 21 (Father’s Day). And I have to say, I think this is the best product that Silver Empire has put out to date. There are some really enjoyable stories in this one from myself, my wife Morgon, and my friends K Bethany Sawyer and Jennifer L Weir. 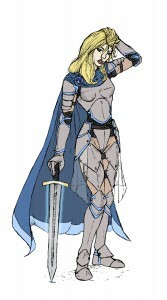 Jennifer’s contribution, “Major Hunter” (from her Wayfarer Chronicles series) is her first publication with us. In my own personal opinion, I think each of the other authors has contributed stories that are their personal best so far. I won’t pretend to be unbiased, but that’s also my honest opinion. My personal favorite of the series is the novella at the end, “Down the Dragon Hole,” by my wife Morgon. It’s got a fun, Pratchett-esque feel to it (although not as silly). But again, I feel that it’s the strongest of a strong collection. You can preorder your copy from Amazon.com today. If you’re a science fiction or fantasy fan, I highly recommend it. I hope you enjoy it as much as we enjoyed putting it together. We’re giving away some great prizes from Silver Empire! Grand Prize: A lifetime subscription to all current and future Silver Empire e-books! First Prize: A complete collection of all Silver Empire e-books published on or before June 30th, 2015! Second Prize: An advance e-book copy of Make Death Proud to Take Us! 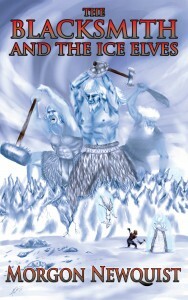 The latest from my wife, “The Blacksmith and the Ice Elves”, is now available! You can pay Amazon.com $0.99 for it or you can download it straight from Silver Empire for free. Personally, I’d opt for the latter. But if you really want to pay us (and Amazon) we’ll take it! “Make Death Proud to Take Us” available for pre-order! Make Death Proud to Take Us – the first anthology from Silver Empire is now available for pre-order on Kindle! Featuring stories from Morgon Newquist, Russell Newquist, K Bethany Sawyer and Jennifer L Weir. Order your Kindle copy today! Courage comes in all shapes and sizes. When his parents fail, little Johnny must protect his younger sister from the creatures that come in the night. Aided by unexpected allies, a village makes its final stand against the onslaught of winter. 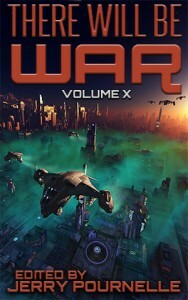 Major Hunter must fight for his very survival after his ship is shot down by hostile aliens on a savage world. The Holt family struggles for survival after a pirate attack leaves their craft stranded in orbit two billion miles from home. An unlikely duo bands together to face the mighty dragon that attacked their campus library. “Who’s Afraid of the Dark?” – a Tale of Peter Bishop. The Kindle edition of “Ghost of the Frost Giant King” is finished and uploaded, and ready for release on March 15th! To celebrate, we’re giving three fans a chance to get a pre-release copy for FREE! All you have to do is agree to leave us an HONEST review (we want to know what you really think!) 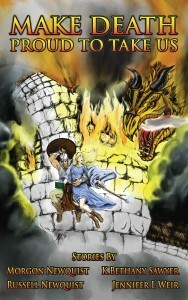 on either Amazon.com or rpg.drivethrustuff.com and we’ll get a copy out to you! Be one of the first three readers to leave a comment on this post and agree to review it and it’s yours! Or you can pre-order your copy today from Amazon.com! The latest from Silver Empire, Second Chances by K Bethany Sawyer is available NOW from the Amazon Kindle Store! A father wrestles with his daughter’s fate as she lies in a coma. He can save her body – but can he save her soul? Pick up your copy today for only $0.99! You won’t want to miss this award winning story from an up-and-coming author! While you’re at the Amazon store anyway, drop in and pick up Wishing Only Wounds the Heart. It’s currently ranked #5 in “Kindle Store > Kindle Short Reads > 30 minutes (12-21 pages) > Science Fiction & Fantasy,” so you know you don’t want to miss it! And this weekend only, it’s FREE! So drop in today and pick up both stories for only $0.99! And don’t forget to leave reviews! Copyright © 2017 by Russell Newquist.